Travel to Camelot, meet Merlin the magician and join the adventures of the Knights of the Round Table in this colourful sticker book. Children can dress King Arthur, Merlin, Lancelot, Morgan le Fay and Sir Mordred in colourful scenes including Arthur pulling the sword from the stone, jousting with Sir Lancelot, Merlin’s library and King Arthur’s final battle. 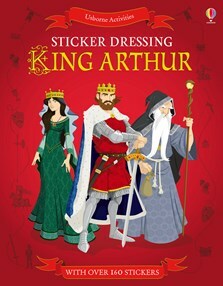 With over 140 stickers, this is a fun and interactive way for children to learn about the legend of King Arthur. Each scene comes with an associated sticker sheet, so little ones can have fun sticking on clothes and accessories to the characters while reading and learning a little bit more about the legends... Gorgeously illustrated and a fab introduction to the rich tapestry of legend surrounding King Arthur.